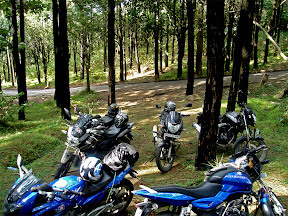 We kept alarm at 5 00 am and as usual got up late.Finally we hit the roads by6 am.After having coffee we headed towards Bandipur National Park.We had to ride through the Bandipur forest to enter Kerala.We were damn excited as we are riding thro the forest!! !.The forests were some 30kms away from Gundulpet.The roads which led to the forests were good.We stopped by to take some pics and videos. After the photo session in a few kms we came across this board and after a while the people started to disappear and we were entering the forest.It was so scary to ride thro the forest.I was expecting wild animals.We were not supposed to stop anywhere but the beauty and sound of the forest made us stop for a few pics.We took some amazing snaps!! !It was drizzling very lightly.The climate was awesome! Then we started again in a few minutes Vignesh spotted an elephant that was eating bamboos on the right side of the roads.Before he told me about the elephant ,the tusker charged at us with a loud trumpetting sound.We were scared like anything and accelerated our bikes to move from that spot quickly.Man that was a real WILD experience!!!! After this incedent we were riding really close with each other in fear of animal attack :) .Then we saw a checkpost-there it was KERALA!!! wow....I was so happy to see people around hehe ;) .The police at the checkpost looked for our license and let us go.We saw these sign boards and clicked pics! 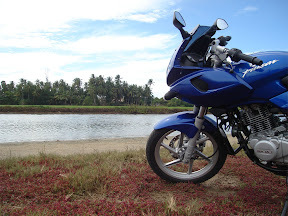 The forest part was over and we were going to a town called Batheri.We asked the route and reached the place.I went to a Bajaj Service center to lubricate my chain.We enjoyed riding thro the awesome twisties of Kerala.The climate was also supporting. We went to Edekkal caves and a dam(forgot its name).The dam was very peaceful and was free from crowds.The entire places we visited in Kerala was having a nice drizzling weather. 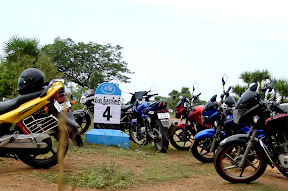 After having our lunch at Batheri we headed back to our lodge at Gundulpet which means we were riding thro Bandipur again!!! !This time I wasnt scary but was eager to spot animals ;) . We were lucky and we spotted a herd of elephants which were peacefully having their lunch ;) .Clicked a few pics and we were out of the forest. We had enough time so clicked as much pics as we could!! Reached the lodge by 5 30 pm.Relaxed for a while and went out for dinner.While having dinner this crazy idea popped! 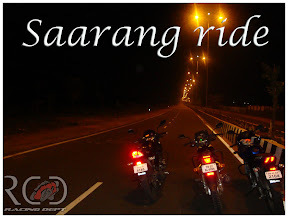 !We decided to ride through the forest again in the night!!!!! !I know we were crazzy!! !Came back to our room took the necessary things and we on our rides!Before even we entered the forests Vignesh was afraid a lot and he convinced e to head back to out hotel :( .Reached the hotel and went to sleep keeping alarm for the next day!